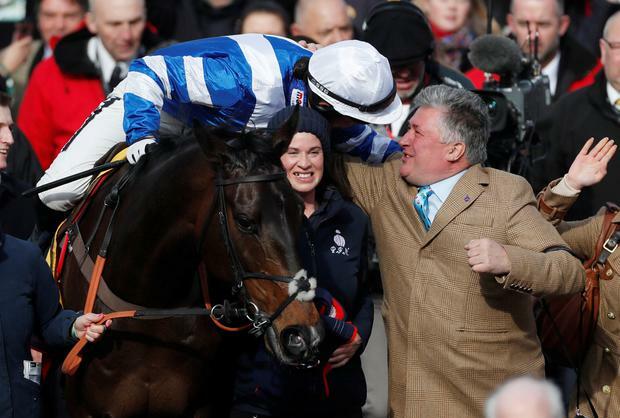 Clan Des Obeaux, the fast-rising star of the steeplechasing ranks, can scale the biggest peak today and provide a resurgent Paul Nicholls with a fifth Magners Gold Cup to go with those won by See More Business, Denman and dual victor Kauto Star. It is an open Gold Cup, about that there appears no doubt. Even the punters are undecided who to send off favourite and any one of three – Clan Des Obeaux, Presenting Percy or last year’s winner Native River – could top the market. No horse comes into this year’s race with better form than Clan Des Obeaux, a gelding part-owned by Paul Barber (See More Business and Denman), Alex Ferguson and his great friend Jed Mason. There was some surprise when jockey Harry Cobden sided with Clan Des Obeaux for the King George at Kempton on St Stephen’s Day. He had been overlooked by the experts, in favour of his shorter-priced stablemate Politologue. But the confident 20-year-old felt he had improved from the Betfair Chase at Haydock in November and was proved conclusively right when the 12-1 shot beat Thistlecrack and Native River by one-and-a-half lengths and 12 lengths. Though no Irish horses were present, the King George has the look of the best chase run in Britain or Ireland this year, and Clan Des Obeaux confirmed it was no fluke when skipping clear of Terrefort at Ascot a month ago. In similar form, he should take all the beating and though some will be wary that he has been to Cheltenham four times and not won, two of those runs were in juvenile hurdles and he was second on the two other occasions, once giving 24lb to the winner. The conditions have come right for Colin Tizzard’s trio of Native River, Thistlecrack and Elegant Escape, just as they have once again gone against Nicky Henderson’s representative Might Bite, whose hard-fought second a year ago appears to have left an indelible mark. The ground, arguably, was too quick for Native River at Haydock, and, less comfortable going right-handed, he did well to finish third at Kempton. The equine flu outbreak prevented him from running at Newbury, where we might have seen more from him. Most Gold Cup winners have, however, got their head in front at some stage during the season. Thistlecrack is now 11 and it is half a century since Paul Kelleway steered a horse older than 10, the 12-year-old What A Myth, to Gold Cup victory. Tizzard’s best shot may, therefore, be with his Welsh National winner Elegant Escape, a staying-on second to Frodon in the Gold Cup trial here in January. We all know what Richard Johnson will try to do on Native River – gallop everything else into the ground in a war of attrition – and he could set up the stamina contest Elegant Escape needs. The elusive Presenting Percy would be the first since Easter Hero 90 years ago to win without having run in a steeplechase that season. I dare say, however, very few have tried trainer Pat Kelly’s unorthodox approach. The publicity-shy trainer has kept sightings of the eight-year-old to a minimum as his favoured soft ground failed to materialise and the Galmoy Hurdle apart, he has schooled him backwards around Galway racecourse to give him practice going left-handed. The eight-year-old, however, should not need too much reminding of Cheltenham, having won a Pertemps Hurdle and the RSA Chase on his only two starts here. The other Irish runners seem to take it in turns beating each other. Willie Mullins, second in the race six times, fields a quarter of the field but, while any of them could run into a place, none seem an obvious candidate to break the hoodoo. Ruby Walsh has gone for Bellshill, while Kemboy ran a career best in the Savills Chase when David Mullins employed front-running tactics to counter his desire to get on with it. Al Boum Photo, a faller in last year’s RSA, would not have to improve a great deal to be in the shake-up and I have a hunch Patrick Mullins will have a good ride on Invitation Only. Anibale Fly was third last year and placed horses have a habit of coming back and running well, if not actually winning, while Nigel Twiston-Davies’s grey Bristol De Mai is clearly hard to catch. If this race were at Haydock in November, he would be favourite. But he will relish the conditions and is, despite regular dips in his form, the joint-highest rated runner, with Native River and Clan Des Obeaux, for me the class act in this year’s race. (© Daily Telegraph, London).